While the DMRF cannot operate without the generous cash donations received every day, there are some gifts for which we are happy to patiently wait. You can make a commitment of support to the DMRF today that is fulfilled in the future.The DMRF Legacy Society was created to recognize those who have made a lifetime commitment in the battle against dystonia. Please consider making a bequest to the DMRF in your will or contact us to discuss any of the planned giving options below. Bequest gifts are the simplest of planned gifts. A bequest is simply a statement in a will that stipulates a gift to an individual or organization--for example, the Dystonia Medical Research Foundation (DMRF). A combination of both large and small bequests throughout the years has enabled the DMRF to continue to move forward in its mission to find a cure and to serve those affected by this debilitating disorder. Sample bequest language is provided below. Please note that the legal name of the DMRF is "the Dystonia Medical Research Foundation." Unrestricted: "to be used for the benefit of the Dystonia Medical Research Foundation (DMRF) as is its Board of Directors may determine." Endowment: "to become part of the general endowment of the Dystonia Medical Research Foundation (DMRF)." Memorial Fund: "to establish a fund known as the _____ Memorial Fund. The Board of Directors of the Dystonia Medical Research Foundation (DMRF), at its discretion, shall determine the use of the income for any purpose. Said Board of Directors may authorize the expenditure of all or any part of the principal of the Fund for some project or special purpose, provided that an appropriate recognition be made in the name of ______ ." Grant/Fellowship Fund: "for the establishment of a grant/fellowship fund to be known as the _____ Grant/Fellowship Fund, with the intent that this be an endowed grant/fellowship fund with only the income being used to make fellowship awards or grants. If the bequest amount does not meet the Dystonia Medical Research Foundation (DMRF) minimum requirements for an endowed grant/fellowship at the time it is received, then the bequest shall be used for general grant/fellowship support and designated as being in memory/recognition of _______ ." A specific purpose: "to be used for the purpose of (be specific) or if such use, in the judgment of the Board of Directors of the Dystonia Medical Research Foundation, is or shall become impractical or unwise, then for such purpose as said Board shall determine." Please contact Director of Development Debbie Durrer at ddurrer@dystonia-foundation.org or 312-755-0198 if you would like more information on establishing a life income plan including Charitable Lead Trust, Charitable Remainder Trust, Charitable Remainder Trust and Charitable Remainder Annuity Trust. 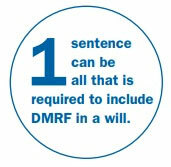 You can name the DMRF as the primary beneficiary of part or all of your life insurance policy. Ask your insurance professional to help you make the Foundation your beneficiary. Thank you for considering these opportunities to support the work of the DMRF!